Wow cannot believe it's already February - wasn't it just yesterday we rolled in the new year? I have always found St. Patrick's Day to be a fun holiday (minus the pinching if not wearing green on that day). I sometimes tried to cheat by pointing out I have green eyes but to no avail. I discovered a few years ago that I do have Irish ancestry - according to a geneaology test I'm 16% Irish. Anyhoo - here are my two cards - and yes there are more up close pics with all the details inside and out. Both of these are made with a clear card base (at least on the front) allowing you to see a little of the inside, but you have to open to see what is concealed by the decorative elements on the front. 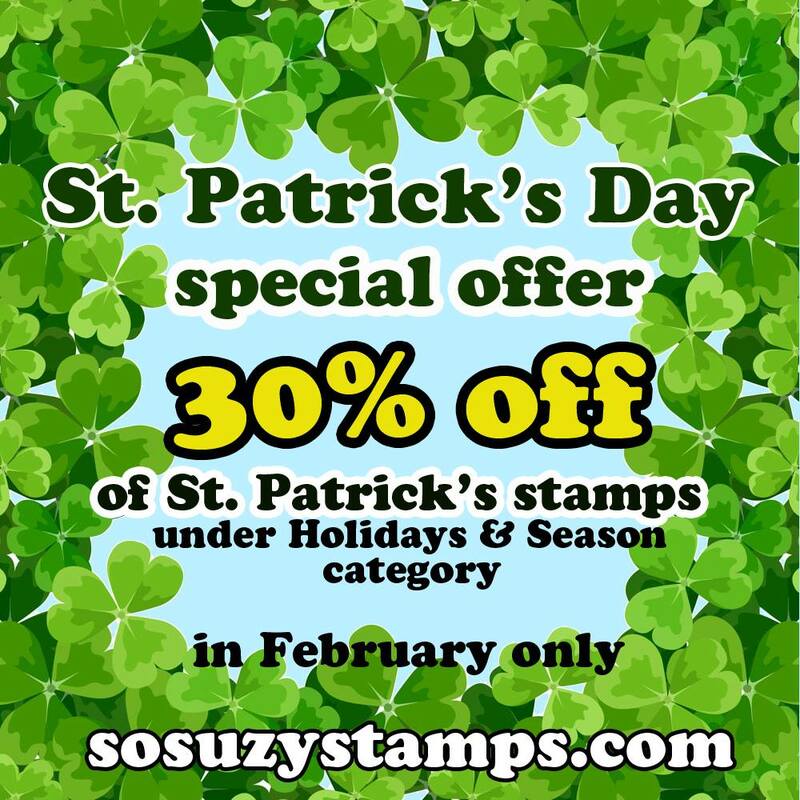 Disclosure: As a design team member of C&S stamps I am part of their affiliate program. All products used from them in this post were provided to me. The Rinea paper & ink was also provided for this post. 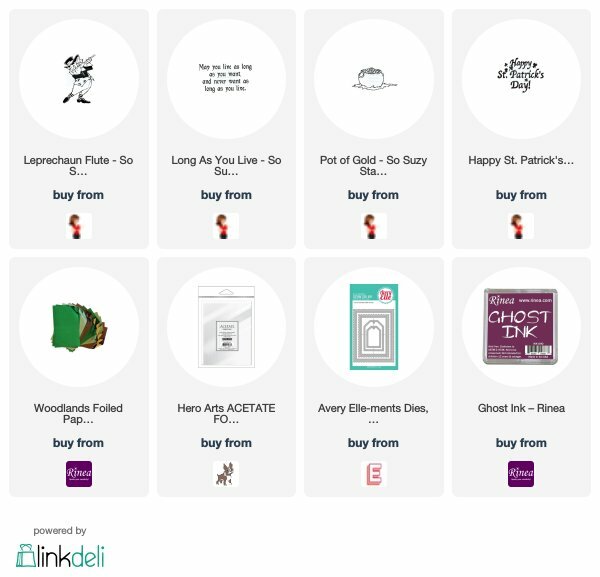 Links to purchase Rinea and other products are not affiliate links. For both cards, I used a clear card base, top folding, A2 sized. I put a sheet of Rinea paper from the Woodland collection in Starstruck Jade light green as the inside panel. It was cut down to 4" x 5.5" so it had a little of the clear card base on each side. 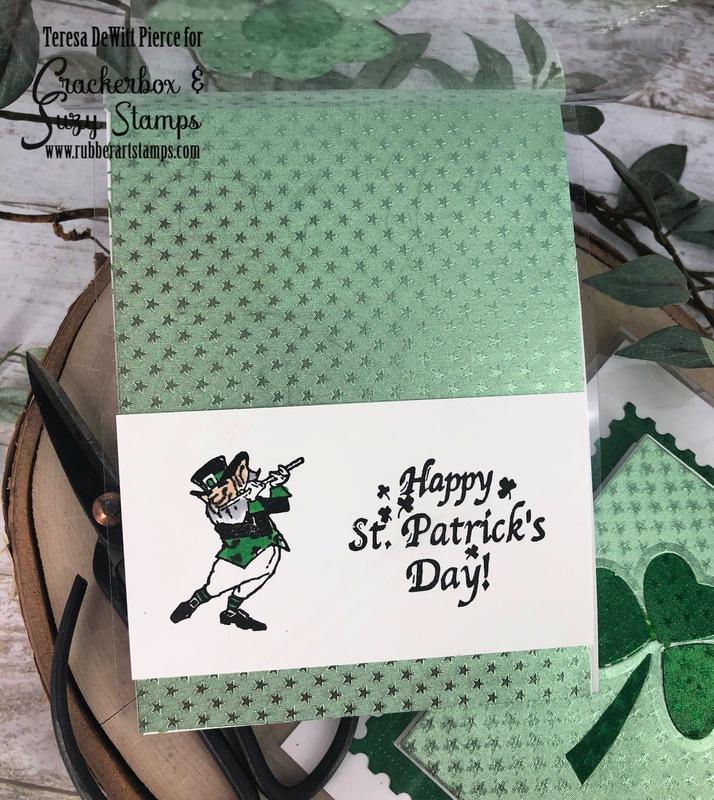 The "shamrocks" you see above were made by die cutting 3 pieces out of two shades of the Rinea foil with a heart die. I used the Jade Green and Emerald Green starstruck colors here. You could use any heart die you have or a punch. The stems were hand cut (no pattern) to coordinate. I made sure the base of the stem was wider than the top. I used a 1/2" glue dot to hold the shamrock together on the back and then took off the backing when ready to adhere to the card front. 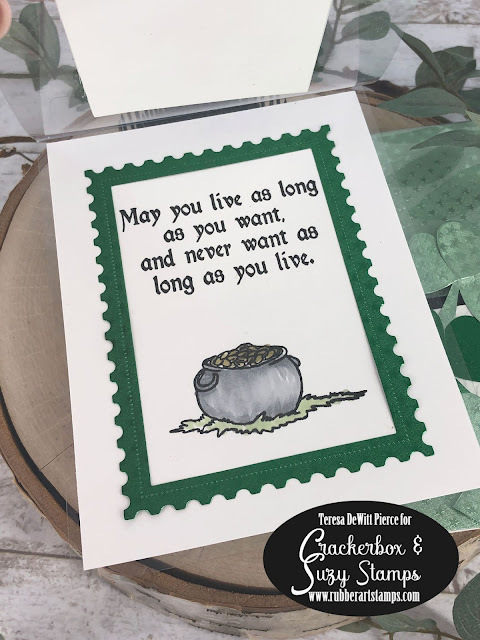 There is a 1 3/4" piece of white cardstock (which I used an embossing folder from my stash to give it some texture) before adding a piece of black glitter paper behind to mat it on. 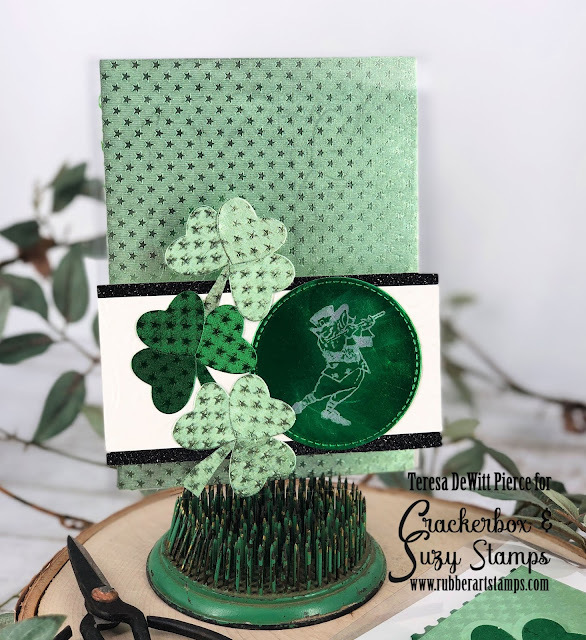 I stamped the leprechaun image with Rinea ghost ink onto a separate piece of glossy emerald green foil using my MISTI, allowed the ink about 20 seconds to dry, then used a paper towel to wipe off the color from the stamped image. I used a circle stitched 2" die to cut out around the image. I placed all the elements on the front of the card. Here I simply added a strip of white cardstock sized to fit exactly behind (and hidden from view) when the card is closed. When you open it you see the same leprechaun image and sentiment stamped in black ink. I used Copic markers to add a little color. While it isn't very easy to tell from this front view that this is a partial see through card from this photo, the next one will make it more apparent. For this one I used the same two colors of Rinea foil as the first card. I used the same heart die, which in my case is a 1" W die from my stash. 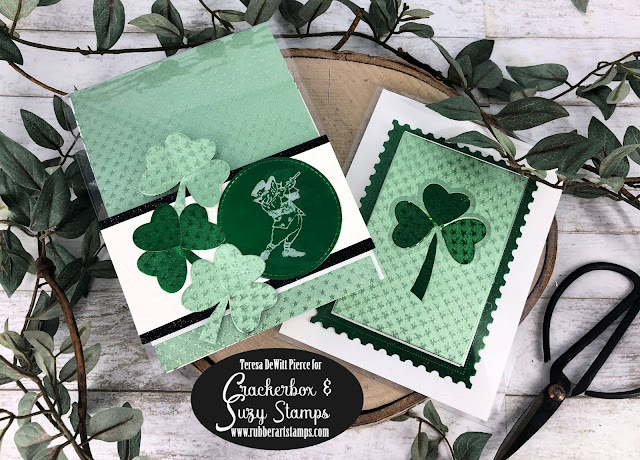 I noticed when I die cut the shamrock leaves that the edge of the die created an impression around the edges on the foiled paper. 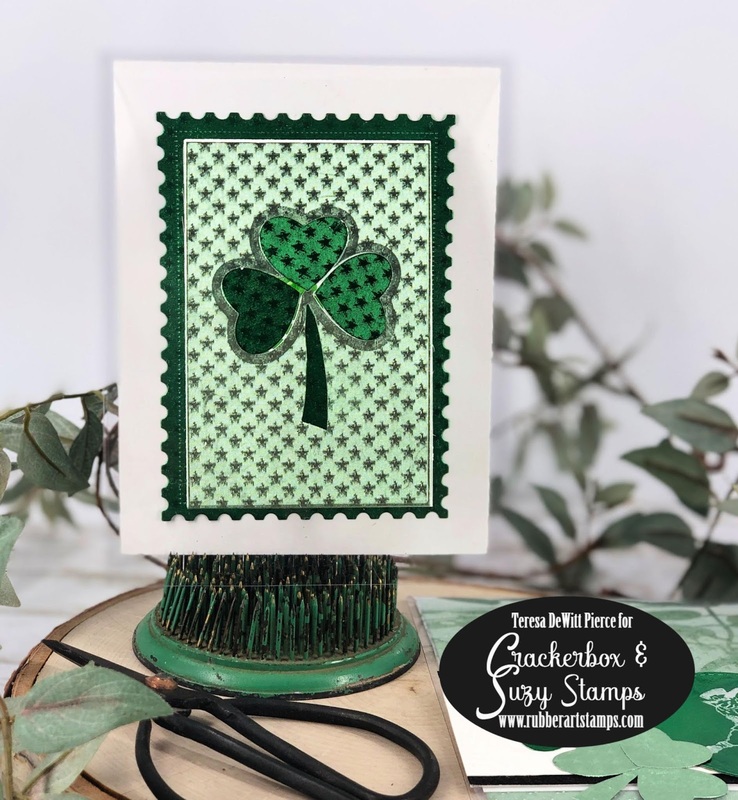 That gave me the idea to create a shamrock as a background onto a piece of the lighter (jade) foil. I am using an Avery Elle postage stamp die to create both the frame as well as the inside rectangle. the emerald shade of foil was used for the frame as well as the die cut inlay pieces on the shamrock itself. Below is a picture of the inside of the card, where I actually adhered the frame. when the card is closed it creates an illusion that the frame is on the outside of the card, when it's really on the inside. The order I did this in was to adhere the rectangle piece first on the front, then used that as a guide to line up the frame before adhering it to the inside panel (white cardstock). After adhering the frame, next I stamped the sentiment and image stamp below it. I also did some very quick coloring with Copics. 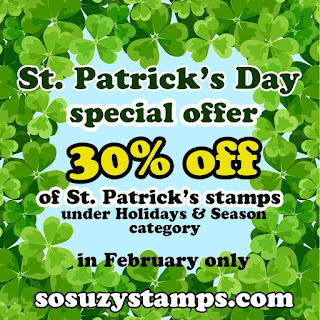 In case I had not mentioned it earlier - this month at Crackerbox & Suzy Stamps, all Saint Patrick's Day stamps are on sale >> shop here.